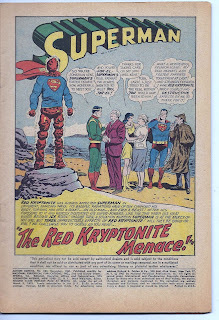 Kav &Tony have returned and Kav has selected Action Comics #283 titled 'The Red Kyrptonite Menace'. 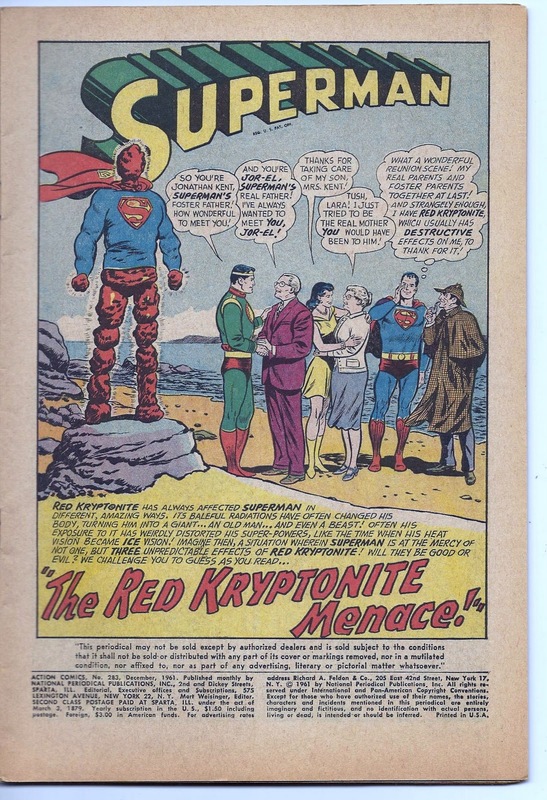 The writer was Robert Bernstein, the pencils were done by Curt Swan, and the inker was Stan Kaye. 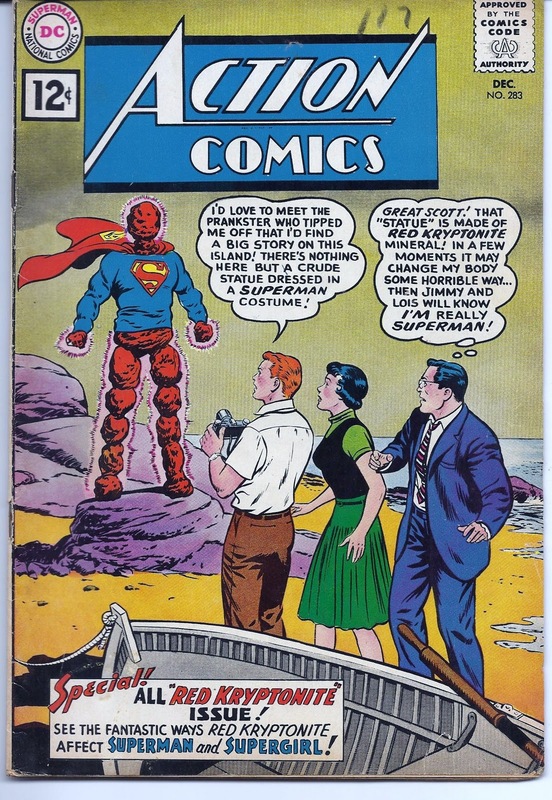 Published in 1961, this comic book also features the story, 'The Six Red K Perils of Supergirl'. Let's break this one down page by page! 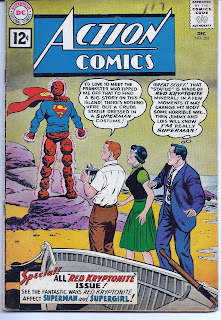 KAV: Here we see the joyous meeting of Superman's real parents with his bogus parents. Only problem? These folks have all met each other, repeatedly, in various other issues. It should be more like, "Oh hey Jore-el, did you get that card I sent you for Krypto-Christmas?" TONY: Who invited Sherlock Holmes to the reunion? Lara tells Mrs. Kent thanks for raising her son and Mrs. Kent responds with, "Tush, Lara..." I found that to be hilarious for some reason. This calls for a little ZZ Top. 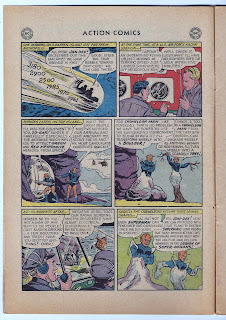 KAV: Here we have two evil chameleon boy dudes appearing in the 20th century to destroy Superman. Why they didn't just destroy Superman when he was a boy is a puzzler. Then they carefully explain their camouflage power to each other as if they just got off the short bus. THEN, they camouflaged themselves so the choppers couldn't spot em. WTF?! They couldn't stay in the cave where they hid the large time bubble is another puzzler. OK obviously it was DC's explaining the guys power for new readers. But I'm just sayin. TONY: That page was an excellent example of what NOT to do as a comic book writer. 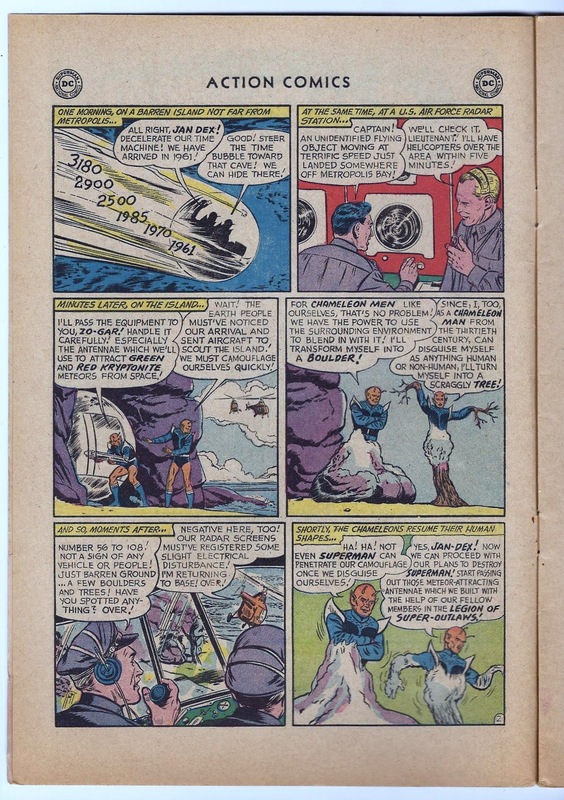 There is a right way to explain a character's motive and power and then there is the wrong way courtesy of Action Comics #283. 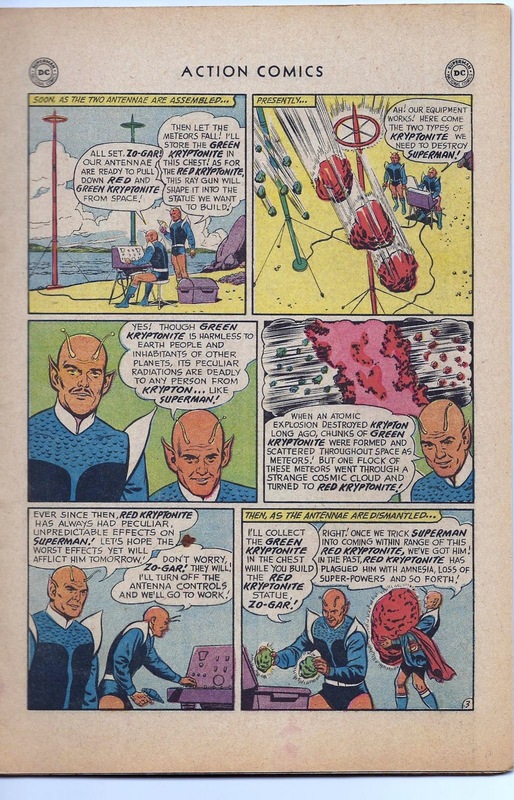 Also, thumbs down to Curt Swan for the generic alien design of the Chameleon Men. Come on, Curt, you're better than that! Hmmmm, you know what this calls for, folks? Click here to see! KAV: Then we have the two antennae which somehow pull down kryptonite from space. Do the poles have to be painted red and green to attract red and green K? Is this sympathetic magic or science? I'm losing track. 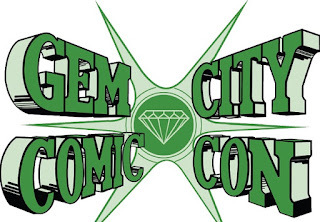 Then the numbskulls explain the history and effects of kryptonite. Imagine them in a presidential debate-they would fit right in. 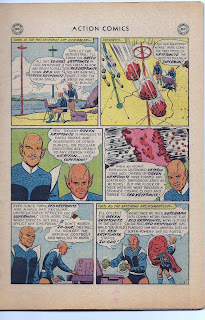 Then the artist was too lazy to draw the kryptonite meteors coming down or else the writer wasted so much time explaining kryptonite that the buzzer sounded. Also, suddenly chameleon people have super strength. TONY: I would not like these guys as friends. I'd ask them to go out for a beer and one of them would reply, "Beer? One of the most popular drinks in the world! Beer is the result of saccharification and fermentation. There are different kinds of beer..."
Next week, Kav and I will break down more pages from Action Comics #283!